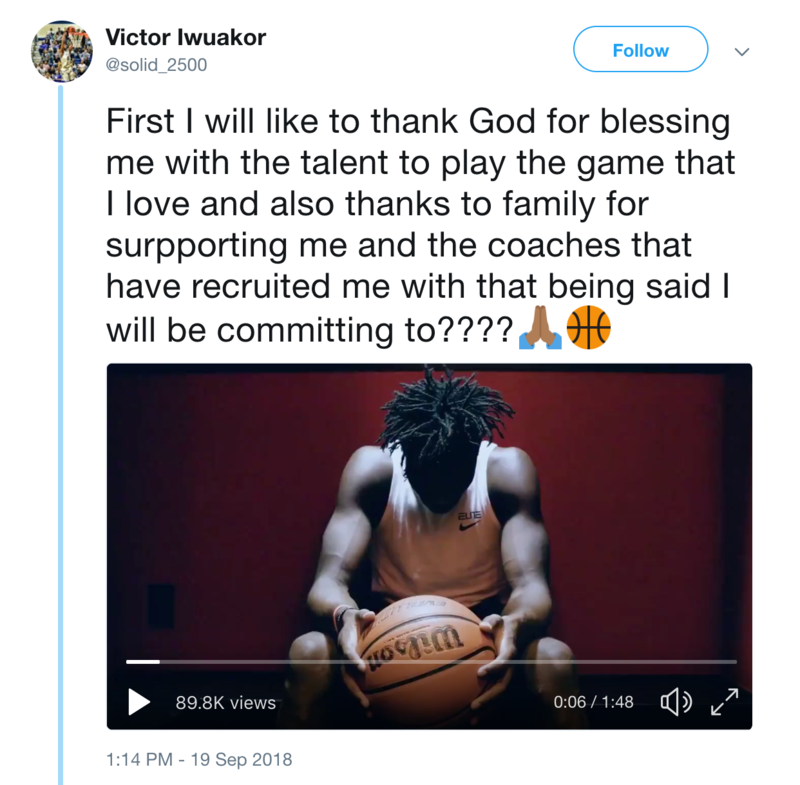 DENVER, September 20, 2018 – Victor Iwuakor announced his university commitment through a video Twitter post on Sept. 19, 2018. The video, produced by Garlic Media Group's Justin LePera, shows the 6-foot 7-inch power forward announcing his decision to commit to the University of Oklahoma. Iwuakor is ranked No. 116 in the nation and No. 27 for his position, according to Rivals.com. Iwuakor is the highest-rated high school power forward or center to commit to OU since 2009. Iwuakor received 28 offers before narrowing his decision. The top five schools in consideration included the University of Oregon, Baylor, Louisiana State University, University of Oklahoma and Texas Tech. It was a big moment for me. I really appreciate all the coaches that offered me. It was a very hard decision. Oklahoma was just the best fit. I can't thank the Summy and Jefferson families enough, as well as all my family and friends who have supported me. Justin LePera, partner at the Denver-based video production company Garlic Media Group, helped Iwuakor create his video announcement. The pair has been working together over the past four years on an upcoming documentary and wanted to create a fun and engaging way to announce his decision. The documentary, directed by LePera, dives into the world of the youth summer league basketball program and will feature Iwuakor and his experience leading up to this point. The documentary also follows the journey of several league alumni including the New York Knicks' Emmanuel Mudiay, the Los Angeles Clippers' Jawun Evans, Clemson’s Elijah Thomas, Michigan State University’s Matt McQuaid, as well as Austin Grandstaff, Hunter Summy, Fielder Summy, Michael “Bubb” Jefferson and other notable athletes on the rise in NCAA basketball and the NBA. The documentary, titled “The Shoe Game,” is estimated to be released in late 2019.